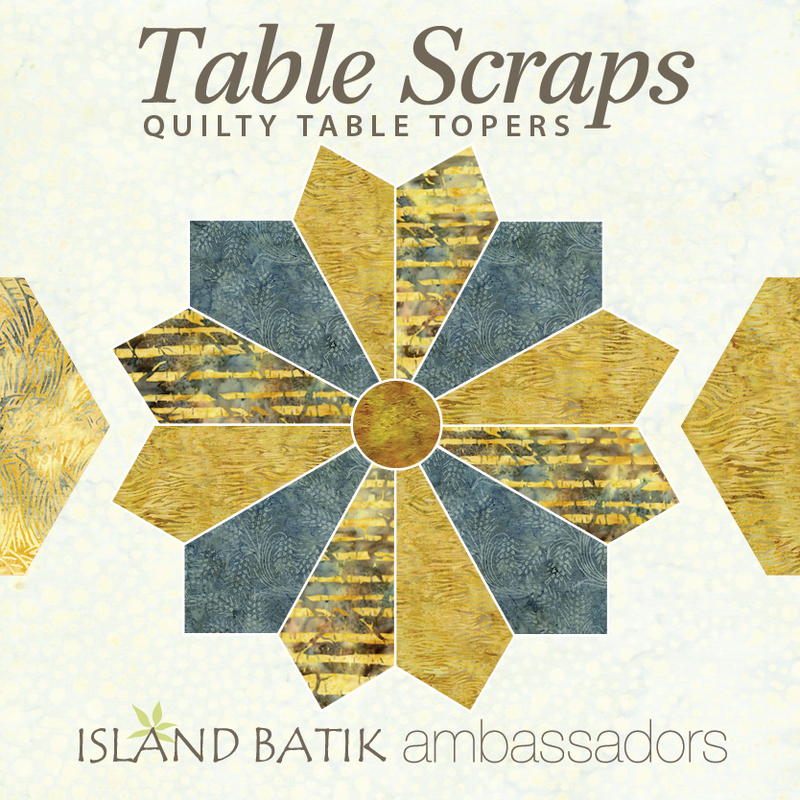 This month's Island Batik challenge for the Island Batik Ambassadors is a scrappy table topper. 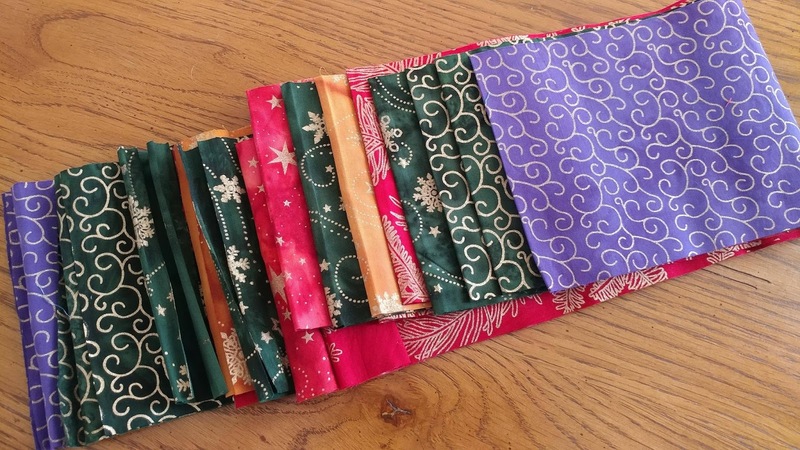 I've had my eye on some 5" holiday fabric strips from my stash builder rolls ever since I got them! There are deep reds and greens and even a deep yellow gold one (I decided against using the purple). They each have gold metallic designs printed on them too. 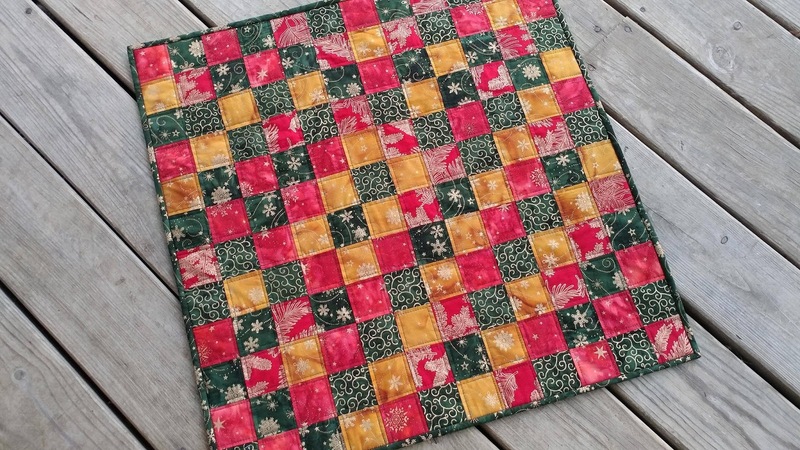 I decided for my quick project, I would just cut one of each strip into 2 1/2" squares and sew them up into a 24" table topper. Each 5" x WOF strip yielded 32 squares. 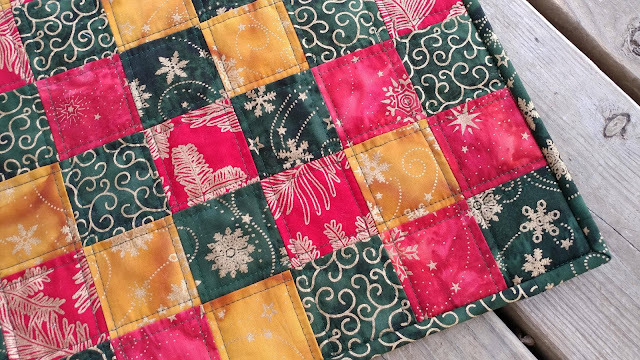 I used five strips and saved two green ones for binding. 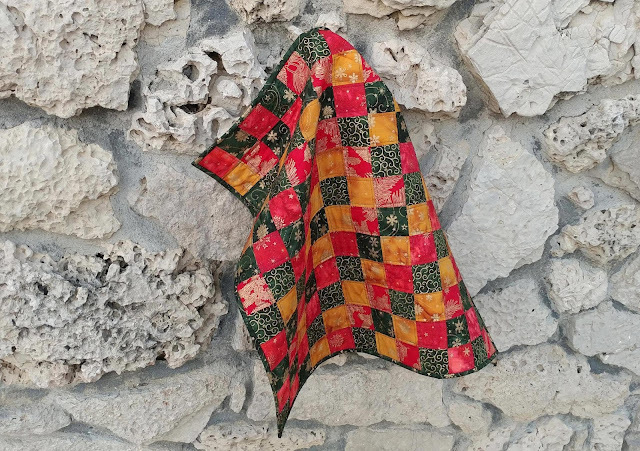 I chain pieced the squares using 50wt Aurifil in #2324 Stone, but did not cut between each row. After sewing 12 sets, I cut the thread, then started back up with the first row again. I just left the thread between each one and kept adding a square to each row until I had 12 squares in each row. I didn't pay much attention to the order of the squares. However, chain piecing this way allows you to have a bit more control over whether or not two squares of the same color would be next to each other. 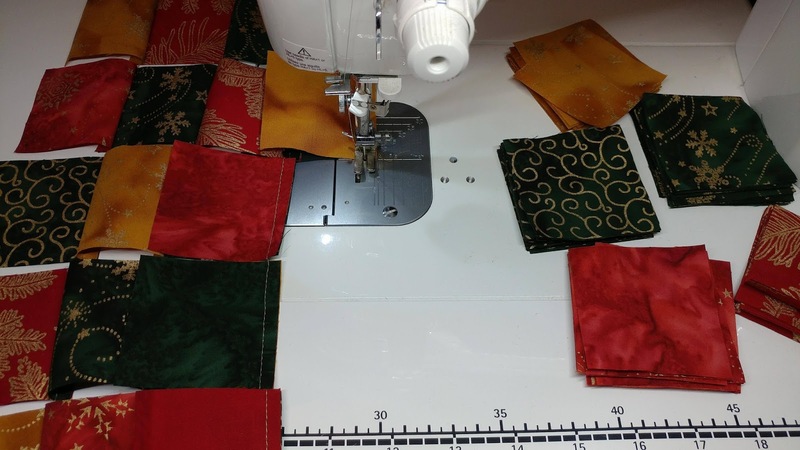 Once the rows were sewn, I pressed the seams in each row in opposite directions, then sewed the rows together. I never cut the threads between the rows. I pin basted the top with 80/20 cotton batting from The Warm Co. and a scrap of Island Batik fabric I had in my stash from the Alpine Ice collection. It doesn't "match" the front, but I'm all for using what I have! Besides, only my mom will flip it over to look at the back once it's on the table! Ha! I used 50wt Aurifil #4026 Forest Green and my walking foot to quilt straight lines on either side of each seam line. 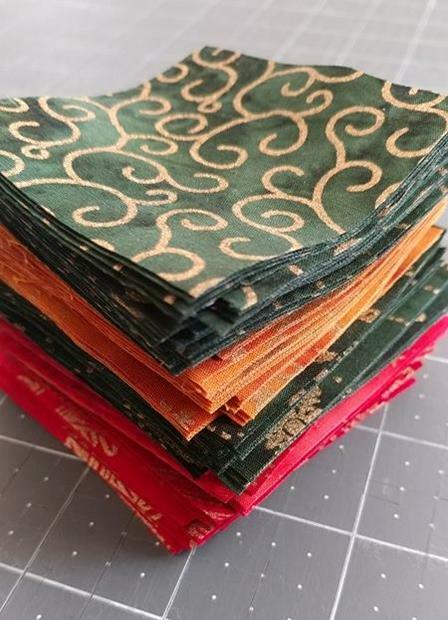 Once quilted, I cut two of the remaining green 5" strips into 2 1/2" strips for the binding. In order to have enough, I had to use two different prints. In hindsight, I would have cut smaller lengths of each and mixed them up a bit more to have a scrappier look. I machine stitched the binding on as usual. Since I've been using 2 1/4" strips for binding lately, the 2 1/2" really seemed quite roomy. 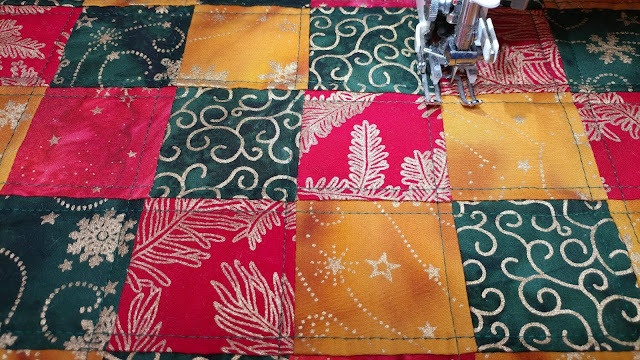 This was the perfect quick finish to clear my head before starting a more complex quilt in the coming weeks. Do you do that too? 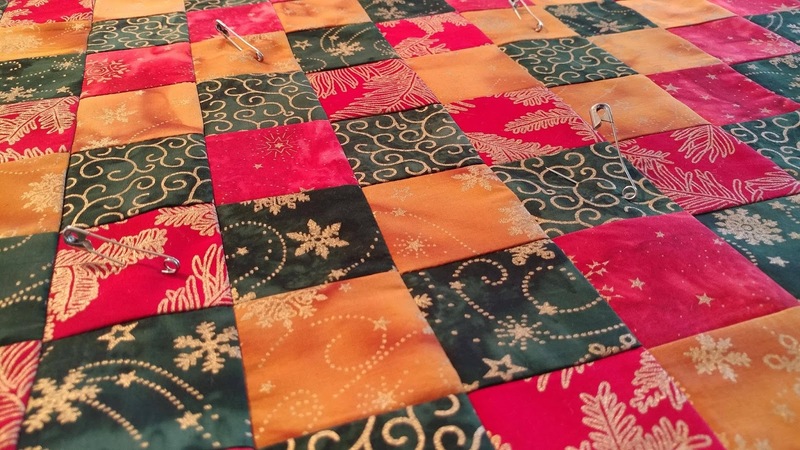 Do you do smaller, quick projects in-between larger ones? This was my 46th quilt finish of the year! (See all my finishes here.) I'm excited to have a new table topper to use this Christmas too! Linking up with Main Crush Monday at Cooking Up Quilts, Monday Making at Love Laugh Quilt, Linky Tuesday at Freemotion by the River, Wednesday Wait Loss at The Inquiring Quilter, Midweek Makers at Quilt Fabrication, Let's Bee Social at Sew Fresh Quilts, Needle and Thread Thursday at My Quilt Infatuation, Finished or Not Friday at Busy Hands Quilts, Finish It Up Friday at Crazy Mom Quilts, and Can I Get a Whoop Whoop? at Confessions of a Fabric Addict. I totally get what you mean by a palette cleanser, I do that too! Usually in the form of a little pouch or bag or something quicker than a full quilt. 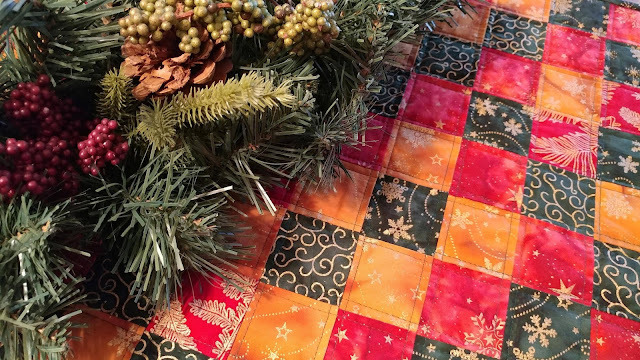 Your table topper is lovely, so festive, and so classic! I love the pops of gold in there ... but I love gold, period! Sometimes it's nice to just do something simple. I did a few this weekend myself so I totally get it! A palette cleanser is a great way to describe a project like this. It's really a lovely finish. 46 finishes for the year is fantastic! 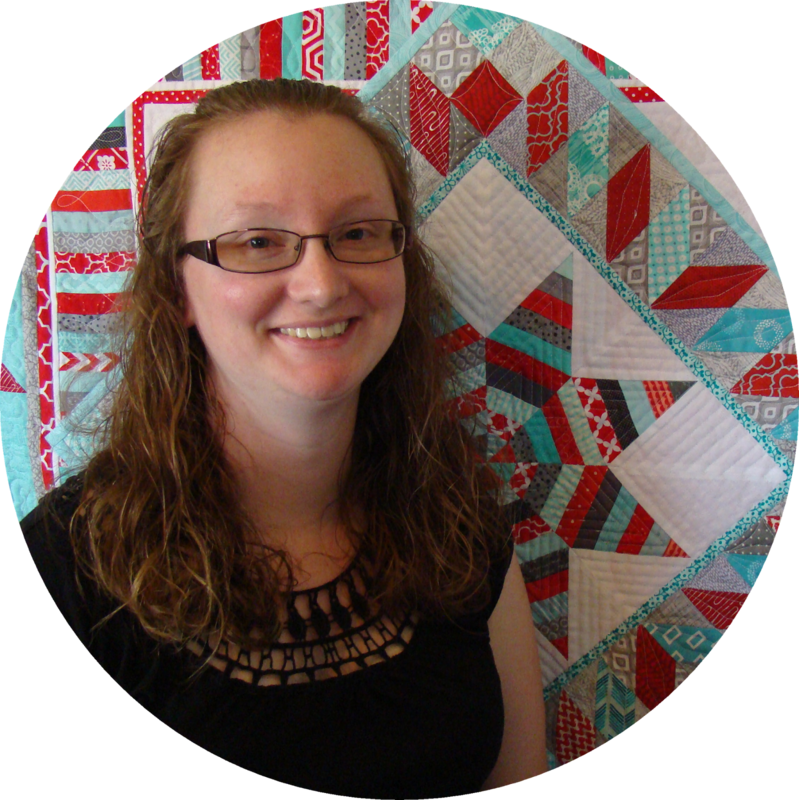 Congratulations on finishing and shipping your final secret sewing! It's just the opposite for me I might do a larger one in between loads and loads of smaller ones! A great scrappy finish you have there. I love the palette cleanser idea - sometimes you gotta do something for you and something fun! 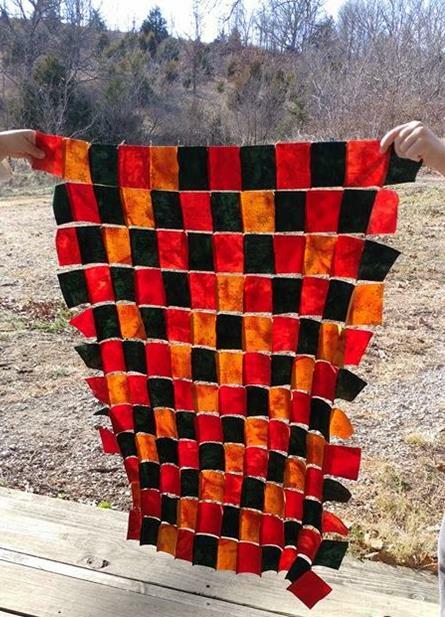 Looks like another fun little quilt. 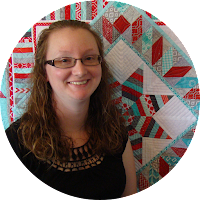 I'm with you on quilt palette cleansers! 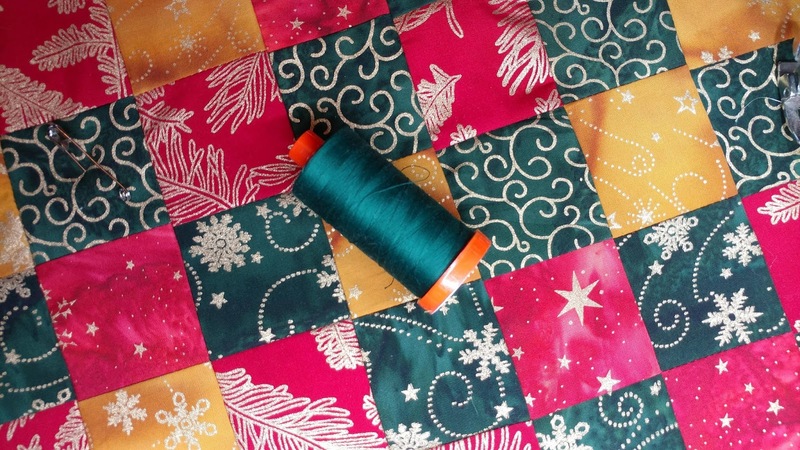 Forty-six quilts?! Great job! 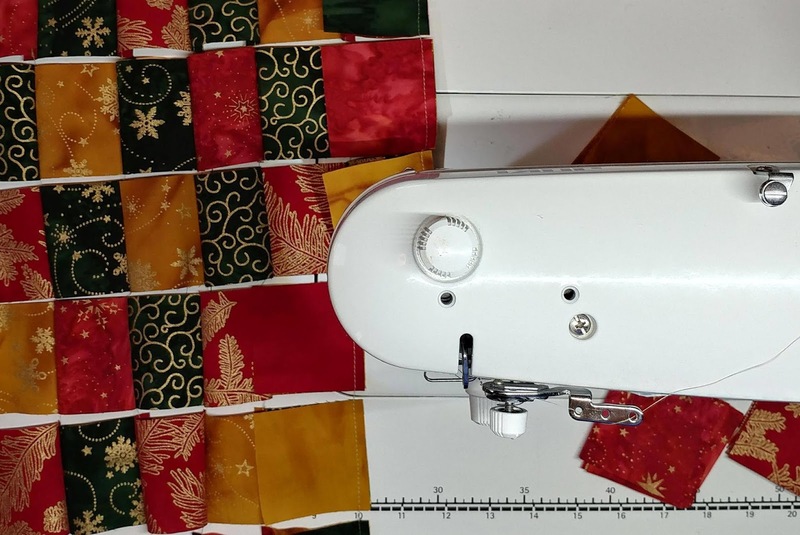 I think you need a longarm! Well done meeting your deadlines. Not a bad effort considering the time of year. And a lovely finish with your table scraps challenge. Perfect for Christmas. Isn't that a fun topper! You certainly have been busy! Yep, I've been there. 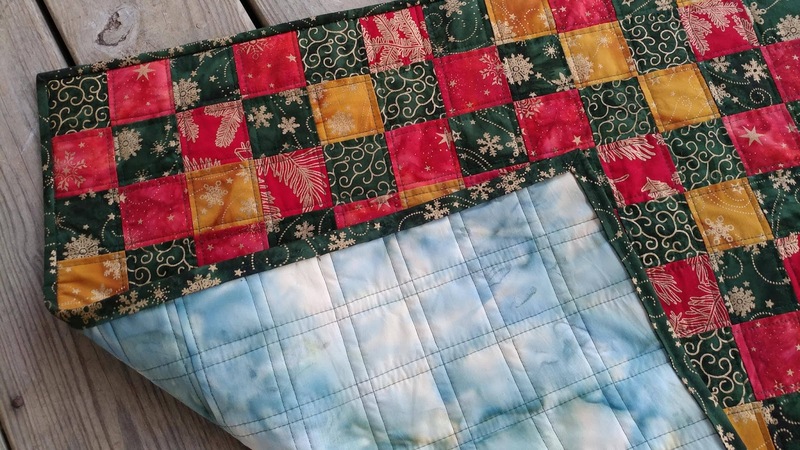 What a great, quick project to cleanse the palette before moving onto the next project. Those batiks look so great together! 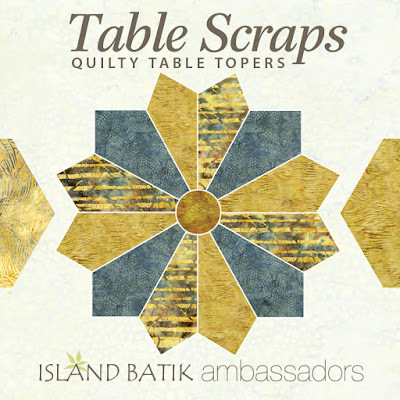 I need to look at what Christmas batiks I might have because this is a great project for them. Thanks for linking to Wednesday Wait Loss. I am in need of a palette cleanser on occasion too! Very interesting how you sew the rows together without snipping the threads!